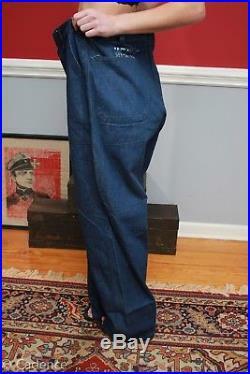 For sale here is a super rare mint pair of US pre WW2 1930s US Navy Denim Dungarees. 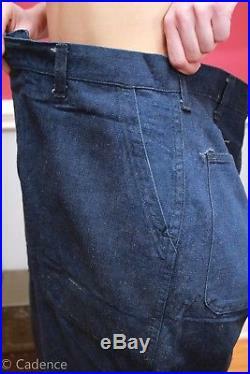 The dungarees are named to Timko, S. The name is written in white paint above each rear pocket. The serial number is written in white paint above the left rear pocket. The pants are in unworn mint condition, but do have light soiling from years of storage. 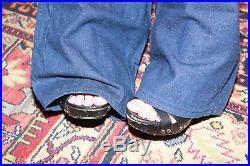 The pants feature a five button front closure. The buttons appear to be black painted brass and are riveted in place. All the buttons are present and in excellent condition. 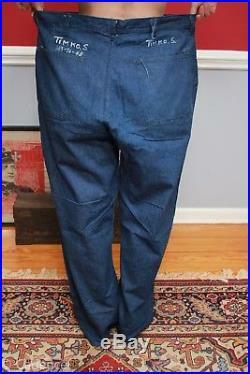 The pants feature seven two inch belt loops, two rear patch pockets, and two front internal patch slash pockets. 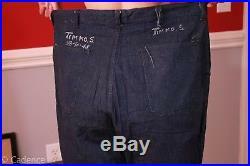 The jeans have quite a few loose strings from manufacture around the waist and pockets and heavy folds from long term storage. The pants are in great and very large wearable size. These are hard to find in any condition or size but here is a large mint pair. The measurements are below for your convenience. You will be pleased. Please feel free to ask any questions that you may have. Please take a look at my other great items! 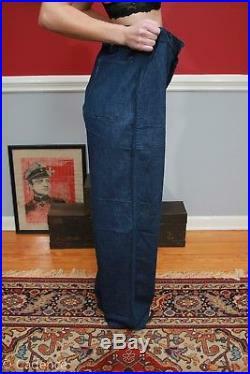 The item “Rare Vintage 1930’s Pre WW2 USN US Navy Denim Jeans Dungarees. MINT! Huge Size” is in sale since Friday, March 16, 2018. This item is in the category “Collectibles\Militaria\WW II (1939-45)\Original Period Items\United States\Uniforms”. The seller is “cadencemilitaria” and is located in Lenoir, North Carolina. This item can be shipped worldwide.